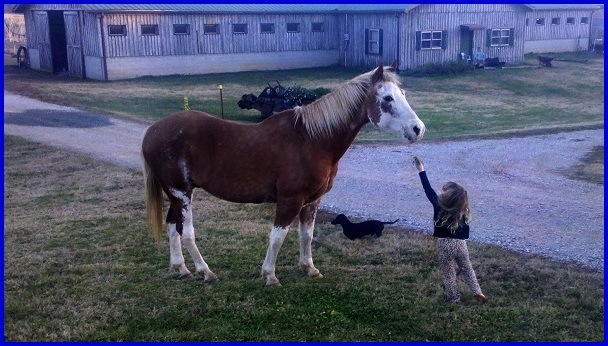 We frequently have young children running and playing here at Blue Point Stables. Often, they are not aware of the dangerous hazards presented by vehicles moving up and down the driveways . Some of our personal horses are allowed “free range” privileges off and on, during their daily turnouts. These horses are easygoing and very, gently creatures. Often they can been seen in our barnyard, our personal home yard, up and down the quarter mile driveway and even popping out from behind close by structures and adjoining fences. Sometimes, horses can be startled or spooked easily. When that happens, it’s possible for them to be in front of your vehicle before you have had a chance to notice. Our small animals (dogs & cats) are constantly dashing across the drive without warning. 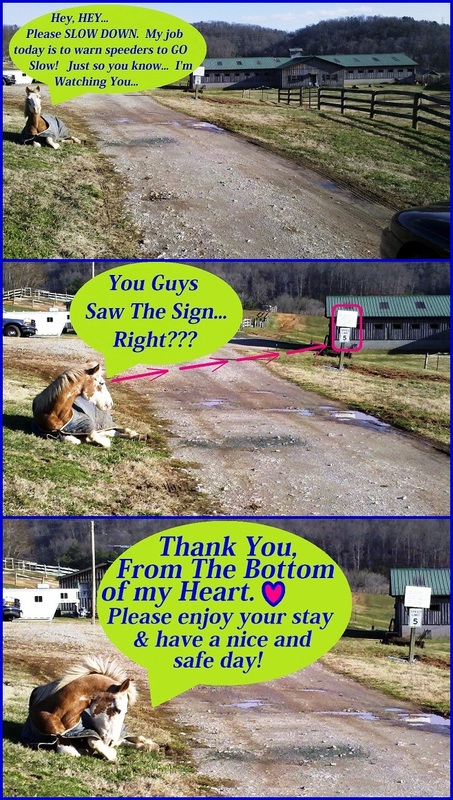 They don’t try to chase vehicles but, often they may be seen an eighth of a mile up the drive trying to greet visitors arriving. In dryer, windier seasons, the gravel dust plumes from fast moving vehicles, are blown across our paddocks, lots and fields. This additional dust then settles across the grass, coating it with a dietary supplement that our horses prefer not to eat (not to mention that it’s just not all that healthy for them to eat). Please accept our personal thanks to each and every one of you for helping us with this effort. We know that by working together, we will all be able to keep Blue Point Stables a safe and happy place to enjoy horses.